One of London’s hidden gems, the Theodore Bullfrog is a traditional English pub just off Villiers Street between Charing Cross and Embankment. Above the pub though was a dingy flat that had been used over the years by pub staff but neglected in terms of décor.When the owner decided to sell the flat, he recognised that a lot of work would be needed to transform this small and pokey property into a modern, contemporary home. So he brought in ani M Interiors to carry out the transformation for him. 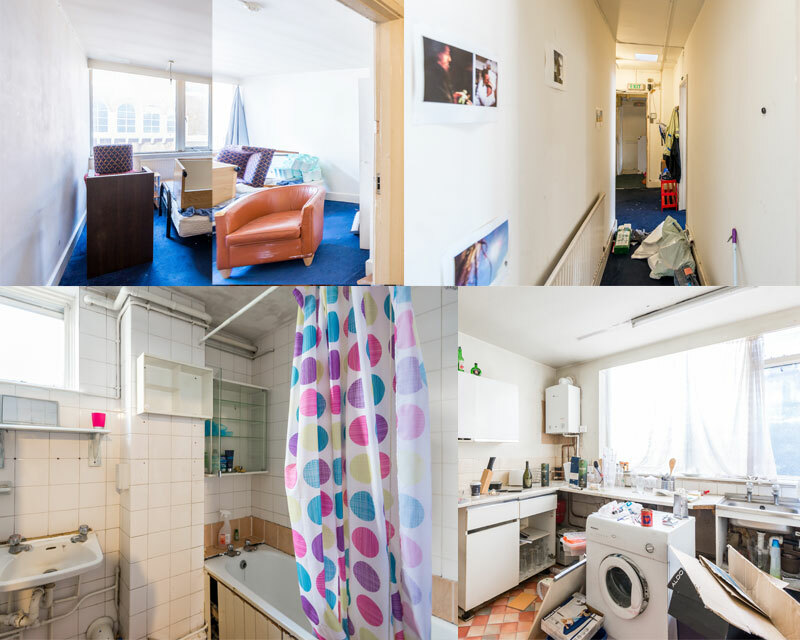 The second floor flat had been untouched for nearly 30 years and was in need of major re-structuring and refurbishment in order to achieve the best possible sales price. 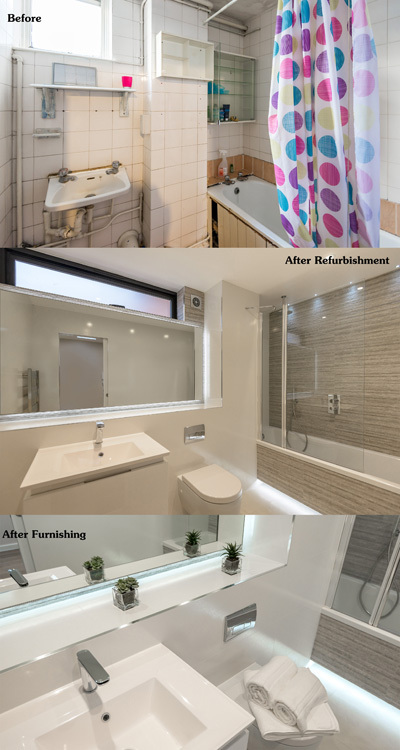 Its existing layout, with three rooms, two kitchens and two bathrooms, was cramped and congested and not designed for a modern, urban lifestyle. And there was potential to create a terrace from an abandoned area that was only used for storing water tanks and a satellite dish – such a waste of valuable outside space in central London. First, we completely reconfigured the flat’s interior. 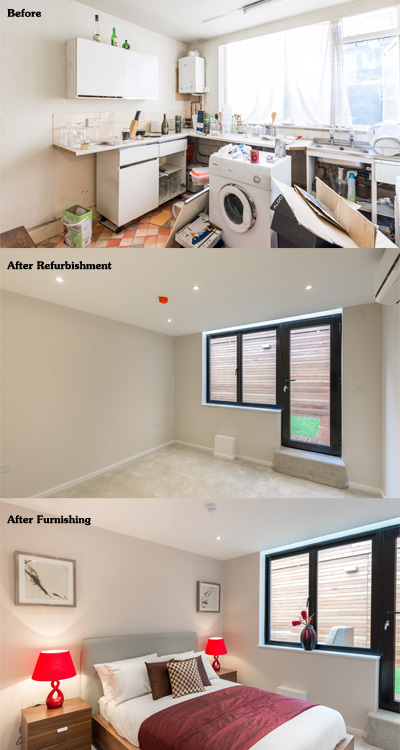 We went back to the bare bones of the property, removing and moving walls and completely rebuilding the interior to create a bright, spacious and contemporary living space with an open plan kitchen/dining and living space, three bedrooms, two en-suite bathrooms and a family bathroom. Structurally there were other issues to contend with too. We were faced with the problem of a pillar in the living space which could not be removed. So our team created a seamless, stretched wall which curves around the pillar. Next to this is a sliding door providing access to the bathroom and on the other side is a walk-in wardrobe. Problem solved! New, double glazed doors and windows, replacing the delapidated metal originals, add character to the interior. 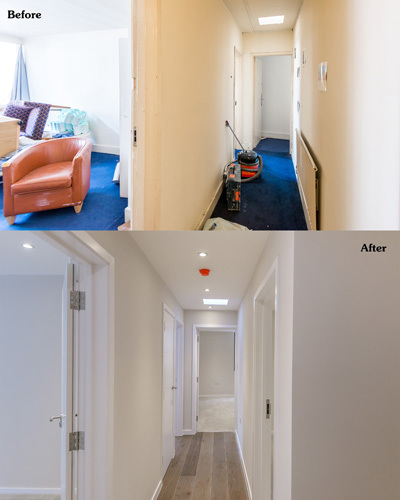 We also levelled the floors, added high quality timber flooring and replastered throughout. We also fitted air conditioning. 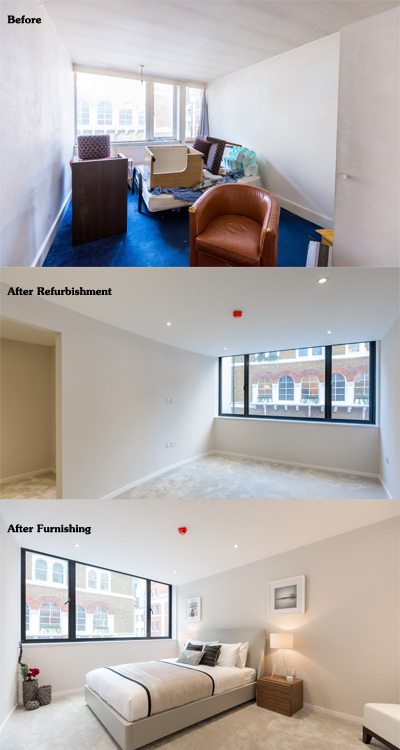 This was not just a cosmetic project – it was important to thoroughly refurbish the building to a high standard, replacing features which had seen better days. Clearly, outside space is highly valued and a real selling point in such a busy, central London location. So the outside roof terrace was to give the flat a real unique selling point. We used IPE hardwood to clad the terrace area, adding artificial grass and hedging. We then added floor lights so that the area can be used both during the day and evening. We created access to the terrace from bedrooms two and three. 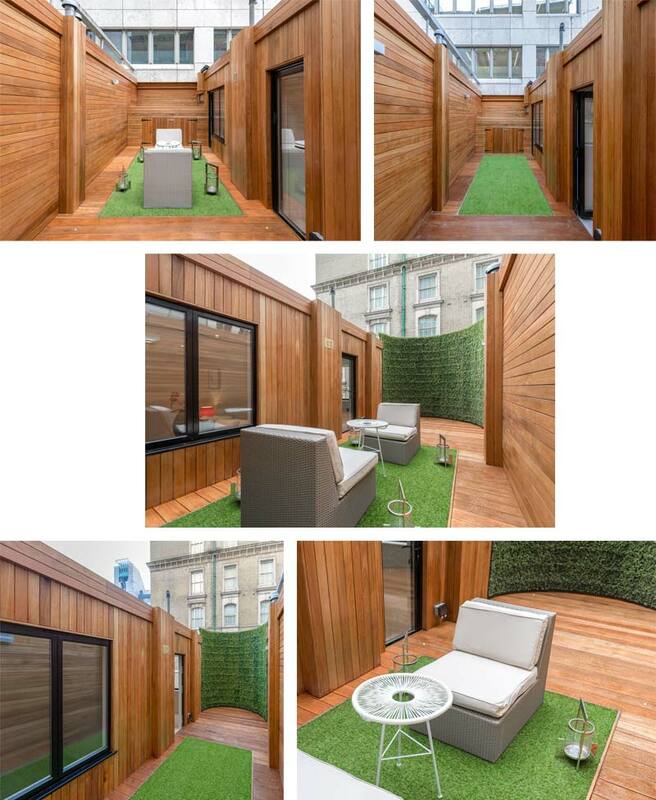 Now the flat has a beautiful outside area where its owners can sit and have a relaxing drink in the evening or even have breakfast on a sunny morning. In fact, this terrace has become perhaps one of the property’s most attractive features. Refurbishing an older property can take a little imagination. 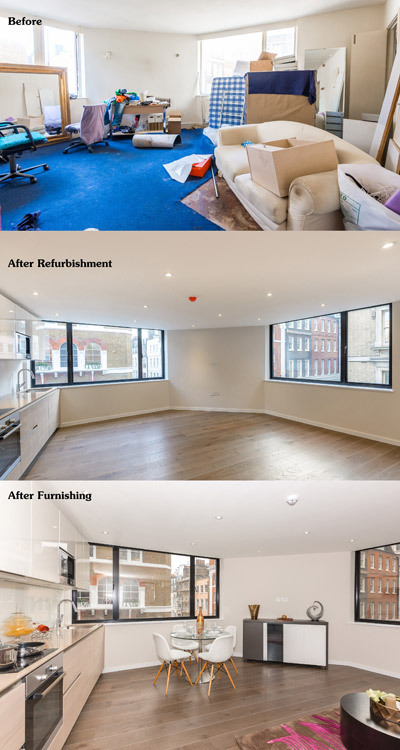 It’s all about thinking about how to best use the overall space, rather than just refurbishing existing rooms. But the results can be dramatic. 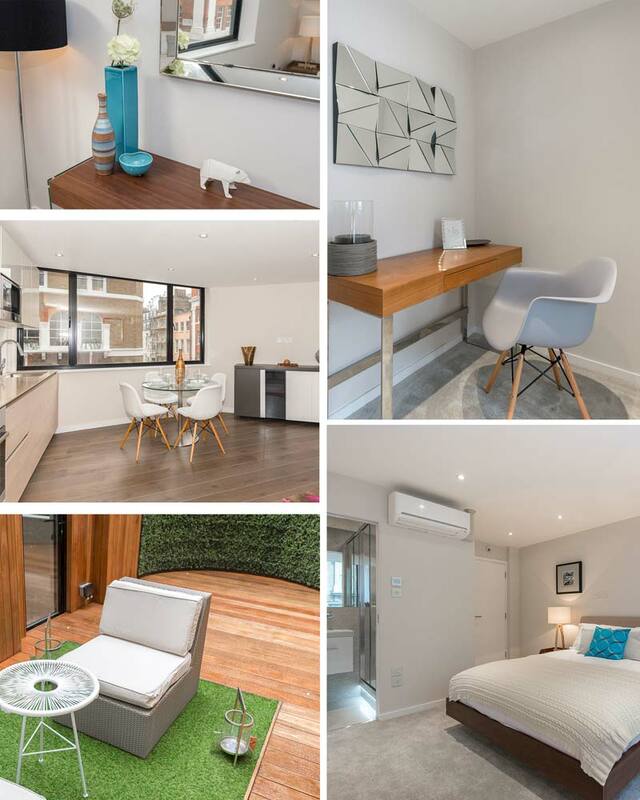 The small, cramped rooms we often find in older properties are restricting and not designed for a modern lifestyle, but thinking creatively allows us to construct a spacious home that perfectly suits the needs of a 21st century lifestyle. 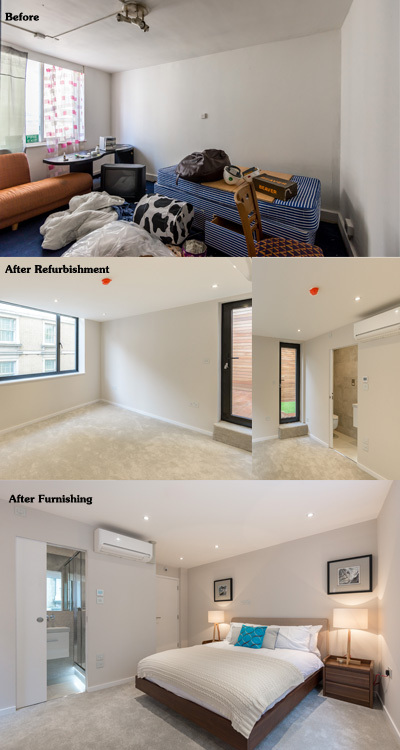 Take a tour through various properties whose aethetical & monetary value has drastically improved & increased through the refurbishment jobs done by us.